It seems as though the Las Vegas pool season gets an earlier start each year. And with an all-new roster of celeb DJs and revamped pool clubs for 2017, Las Vegas hopes to lure back summer’s splashiest revelers that pay up to $100,000 for select bungalows and cabanas along The Strip during summer weekends in Sin City. Widely considered the hottest pool club on the strip, Encore Beach Club gets an all-new look for 2017 with refreshed cabanas and party capacity that is 25% larger this year. Look for headliners like Dillon Francis, David Guetta, Ookay and Diplo in April alone with Kygo, Alesso and The Chainsmokers later in May. Perhaps the only real completion for Encore Beach Club is MGM Grand's WET Republic, who this year celebrates its 10th season. It's springtime weekend line-up combines champagne slushees with DJs like Steve Aoki, Lil Jon, Zedd and Tiesto - with Kaskade, Afrojack and Hardwell joining the May calendar. Relative newcomer Drai's Beach Club brings its own celebrity calendar for 2017 with 50-Cent, Zeds Dead and Wiz Khalifa and Future taking over the rooftop pool club that’s been touted as one of the best in town by locals who prefer its more approachable atmosphere that feels more pool than concert venue. In recent years new hotels like the SLS, Cosmopolitan and Aria have attempted to duplicate the success of Wynn’s lucrative pool clubs. SLS continues to invest in its struggling Foxtail Pool Club with the springtime line-up of ever-festive Flo Rida, T-Pain and Lil Wayne that trends more hip-hop than house this year. Marquee Day Club lures a lesser wattage of DJ talent to its pool club that was domed to allow for year-round partying. Sadly Aria fails to impress yet again after several revamps and DJ headliners that still have yet to make a name for its Liquid Pool. 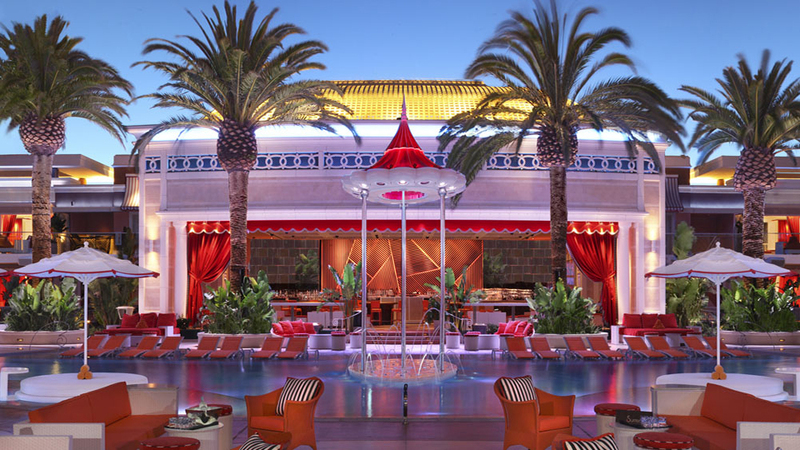 And for those that like a comeback story, Palms Pool & Dayclub hopes to recreate its Britney heydays with a new event lineup this season as the resort is now under the ownership of Station Casinos.